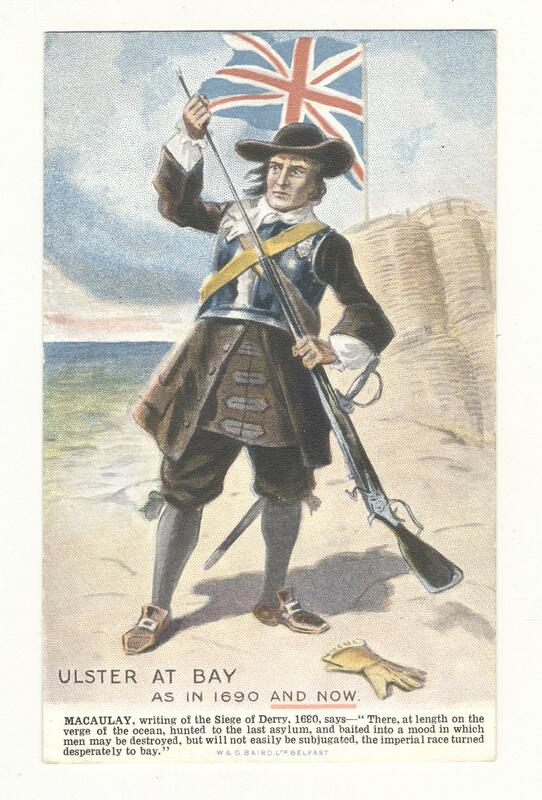 Postcard showing 'Ulster at Bay as in 1690 and Now.' Macaulay, writing of the Seige of Derry, 1690 says: "There, at length on teh verge of the ocean, hunted to the last asylum, and baited into a mood in which men may be destroyed, but will not easily be subjugated, the imperial race turned desperately to bay." On reverse: THOUGH DEAD< YET SPEAKETH. Lord Randolph Churchill, speaking at Bayswater February, 1886, said: " He believed there were hundreds and thousands of English hearts and also hands ready when the moment of trial came when Protestants of Ireland were called upon, as they might be called upon, to give in a most practical and convincing form of demonstration a proof of their loyalty to the English Throne.... They would be of opinion that before the sun of the British Empire would commence to set, a blow would have to be, and a blow would be struck (cheers) the sound of which would go into all lands, and the echoes of which should reverberate into the uttermost corners of the earth."